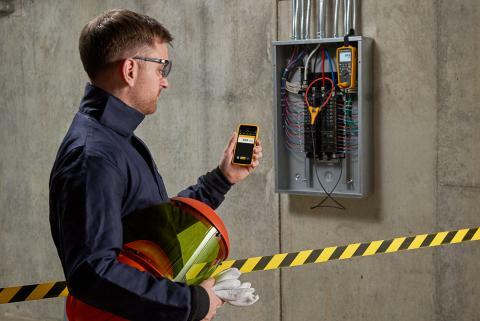 Some higher performance digital multimeters such as the Fluke 187, Fluke 189 and Fluke 87V include a recording function that allows users to capture much faster signal events than the normal min/max function found on many DMMs. The FAST MN/MX (187, 189) or Peak Min/Max (87V) function is restricted to the voltage and current measurement. FAST MN/MX or Peak Min/Max can be used to capture intermittent or transient events that occur on a monitored signal over time. Events as short as 250 µs (or longer) can be captured using these functions. During this monitoring process the meter will capture, and temporarily hold, the highest and lowest values measured by the meter. In addition, the meter will maintain a running average (187, 189 only) of the signal levels measured during the monitoring process. The average reading is useful for estimating the percent of time a circuit is active or for determining the overall level of stability for the monitored signal. Along with these captured levels, the Fluke 187 and 189 have a real time clock and an elapsed time clock built in (187, 189 only) that will timestamp the highest, lowest and average values so the user will know exactly when these readings occurred. When the recording process is underway, elapsed time (187, 189 only) is displayed. Elapsed time is the running time since recording was started. The elapsed time clock is a powerful addition to the meter's monitoring capabilities, because knowing the precise timing of the highest and lowest signal variations can be very important. The user can gain critical insight into the stability of the signal or the system being evaluated and know exactly what time unusual events may have taken place. This can be a real asset, and a time saver as a troubleshooting tool, if the user is looking for intermittent or transient events during a time when he or she is not able to be present for these events. The FAST MN/MX or Peak Min/Max function is a tremendous asset to the troubleshooter's arsenal of available tools, even more powerful than the standard min - max record modes. First and foremost, read the instruction manual and follow all safety precautions and use safe work practices. 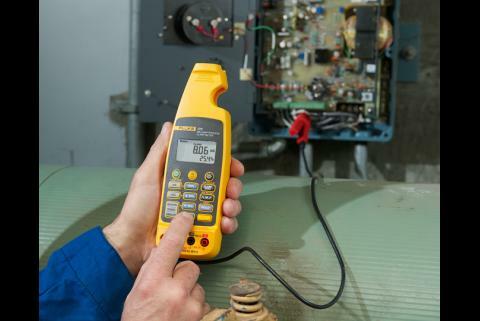 Select the appropriate meter function for the measurement to be monitored. 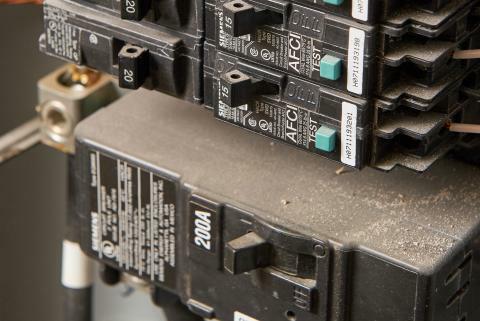 Attach the test probes to the test points using suitable alligator clips or other connection devices that will allow for a solid connection while the monitoring process is underway. Once the leads are attached to the signal to be monitored, push the SHIFT button then the MIN MAX pushbutton once. This starts the FAST MN/MX recording process. The FAST MAX symbol will appear, along with the present MAX value, in the display. On the Fluke 87V, once the leads are attached to the signal to be monitored, push the MIN MAX button, then the ~ (continuity) pushbutton once. This starts the Peak Min/Max recording process. The Peak Min/Max symbol will appear, along with the present MAX value, in the display. The monitoring process is now underway and the meter is now locked into the manual range providing the best resolution for the measurement. Make a mental note or record on paper the time of day the process was started (187 only). Remembering the time of day recording was started is not necessary if the readings are stored in saved memory in the 189. NOTE: The Fluke 87V does not have the elapsed time clock capability. When using FAST MN/MX or Peak Min/Max function for ac voltage or current monitoring, the display shows peak values for the minimum and maximum readings and the rms value (187, 189 only) for the average reading. For ac signals that are sinusoidal in shape, the peak value is 1.414 times the rms value. For example, a standard sinusoidal 120 volt rms signal should have a peak value of 169.7 volts. An rms-to-peak ratio of less than 1.414 would indicate a flat topped signal, and a ratio greater than 1.414 would indicate the signal is more peaked than a pure sine wave. The rms-to-peak ratio is also referred to as the crest factor. Viewing the captured high and low readings at any time during the monitoring process is easy. Each press of the MIN MAX pushbutton allows the user to cycle through each of the minimum, maximum and average (187, 189 only) values temporarily stored. Once the monitoring process is complete, but before disconnecting the test leads from the circuit, press the HOLD pushbutton. This retains the minimum, maximum and average values for viewing (187) or for saving the recorded values to the Saved Readings memory (189) for upload later into FlukeView Forms software. To save each of the captured readings to the 189's Saved Readings memory, simply push the SHIFT pushbutton, then the SAVE pushbutton for each reading (minimum, maximum or average) to be stored in memory. The readings are automatically stored in the unit's next available empty memory location. If the user doesn't press the HOLD button before disconnecting the leads, the MIN value will be lost and the AVG value compromised. To view the stored FAST MN/MX/AVG readings, turn the rotary function switch to the "VIEW MEMORY" switch position, press the SETUP and then the SAVE pushbuttons. The user then can view individually saved readings by using the UP/DOWN arrow keys. Looking at the lower left of the above displays, the numbers 015, 013 and 014 are the respective memory locations where these readings are stored. The clock in the lower right corner of the display is the actual real time of day these readings were stored. By storing the values, the troubleshooter no longer needs to remember the exact time the recording process was started in order to determine when specific events occurred. 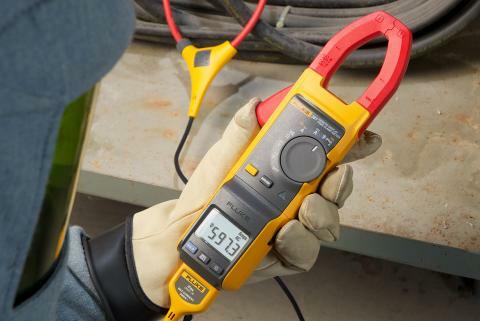 In summary, the FAST MN/MX or Peak Min/Max functions found on the Fluke 187, Fluke 189 and Fluke 87V multimeters offer the user another very powerful troubleshooting tool. It allows technicians to monitor systems or processes for unexpected events without being present, leaving that time available for other facilities needs.